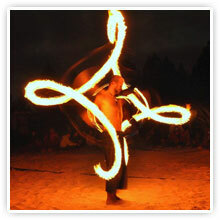 Isa Isaacs is the founder of Temple of poi fire dancing school, and is well known as one of the original and best fire poi dancers. Take a look at some of her videos below, they are old, but even back then, she was making it look awesome! I am a huge Glitter Girl fan, she rocks! I finally got a chance to break in my new medium sized cathedral fire poi from Home of Poi last night when I was invited to a fire night by Arise and Hoop, where they light up a variety of fire toys every week. I have been eager to give these poi a spin and I must say that was not disappointed at all. These are really solid poi, they are quite large for medium sized poi, and have a long burn time because they can absorb so much fuel, which also makes them quite heavy at first. They also come with a strong ball chain as opposed to a flat chain, and leather finger loops. The Psychedelic Theatre was born in 2010 in one of the world’s largest Psy Trance music scenes. The Psychedelic Theatre is the brain child of dancer, physical theatre performer, fire dancer and actress, Lanél Van Der Kolff, and actor, fire dancer, and poi artist, Marvin-Lee Beukes. They burn Poi, Hula-hoops, Rhythm Sticks, Swords, Ropes, Staff and breath fire too. If you have been doing fire poi for a while, and are part of one of many poi communities in South Africa, then you would have heard of or met Jaco le Roux. Jaco is one of South Africa’s very own poi masters, he travels around the country teaching poi workshops and entertaining as he goes, and is currently based in Durban. I found an awesome video of Ivan Gorbunov AKA ‘Mel’ from the Ukraine doing some freestyle fire poi at the Live Fires Festival. How sick is this video?! 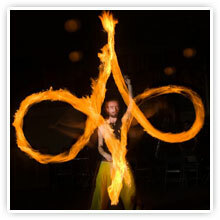 This site is dedicated to fire poi as well as normal poi and glow stick spinning, and the related skill toys such as hula hooping, devil sticks, fans, swords etc. If you have anything interesting that you would like to talk about on this site, drop me an email at info@firepoi.co.za. Cheers!